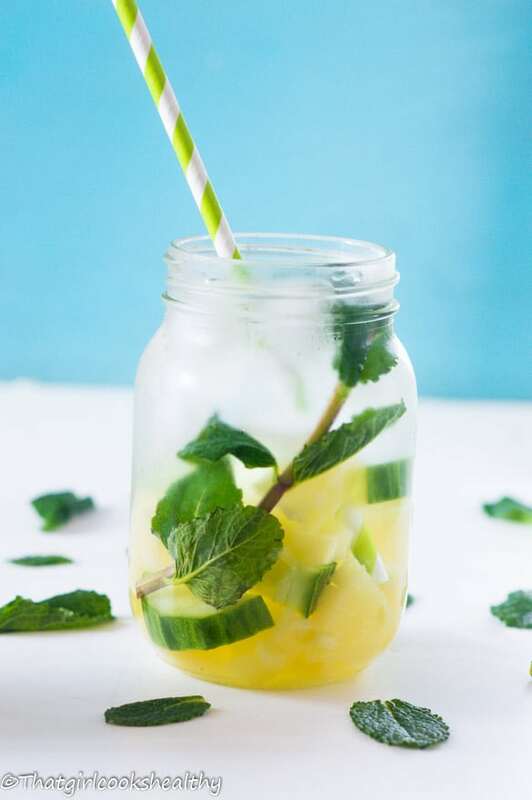 If you’re a health enthusiast like me then chances are you’re probably seen a load of fruit infused water circulating the internet. 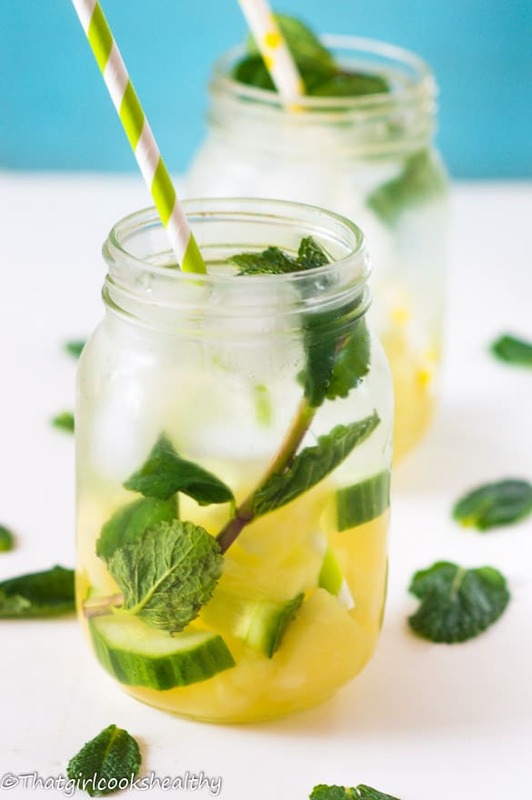 Fruit infused water is so refreshing, especially on a hot summer’s day. They also make the best endless beverage, as you only need to top up with water – how cool is that? Fruit infused water is essentially what the name suggests, adding a few pieces or even slices of fruit to your water. You might be wondering why in the world would someone do that? Why not extract the juice from the fruit or eat it by itself? Good question! Look at it this way, a large percentage of our body constitutes water, we need water more than food. Trust me if you’re unfortunate enough to find yourself stranded on a scorching hot deserted island, with no food in sight. There’s a good chance you’ll be able to survive providing you can find an oasis or a source of clean water to hydrate the body. My analogy might sound extreme or highly unlikely for some BUT….I feel I should emphasize the importance of consuming water. 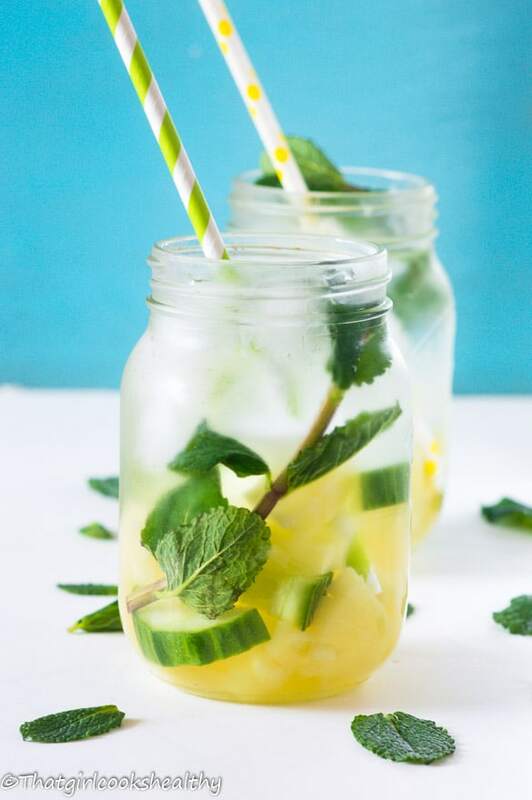 It’s not uncommon for people to loathe water or simply find it boring, that’s why fruit infused water is the perfect way to met your recommended 8 glasses of water per day. You can add whatever fruit or even vegetable you wish, the world is your oyster and you are in complete control. Fruit infused water acts like a cleanser, see it as a mode of entry to the world of detox. Water not only dehydrates the body, it also flushes out the toxins from our vital organs such as the skin, kidney and liver. The liver’s primary function is to break down fat, it also needs replenishing to rid itself of any build up of toxins which might inhibit weight loss. 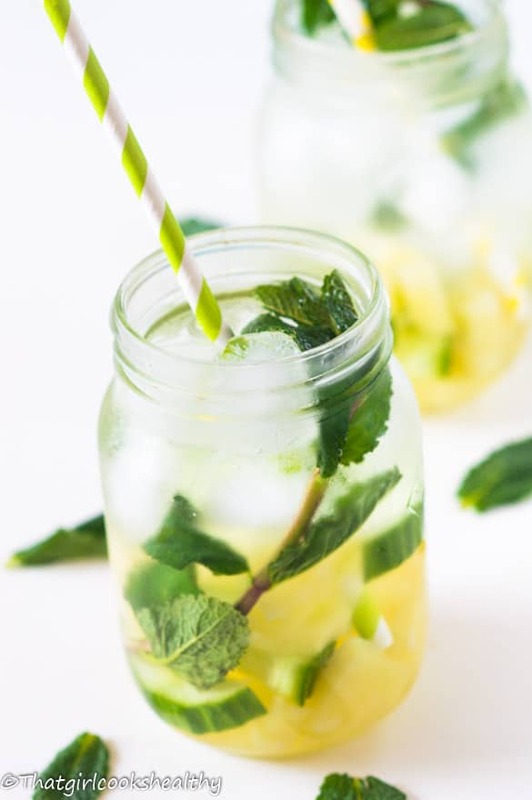 There are no written rules for making pineapple mint fruit infused water, it’s really a matter of taste. The more fruit you add, the more concentrated the flavour of the water. I added about a cup’s worth of fruit, a few slices of cucumber and replenished my water bottle accordingly. 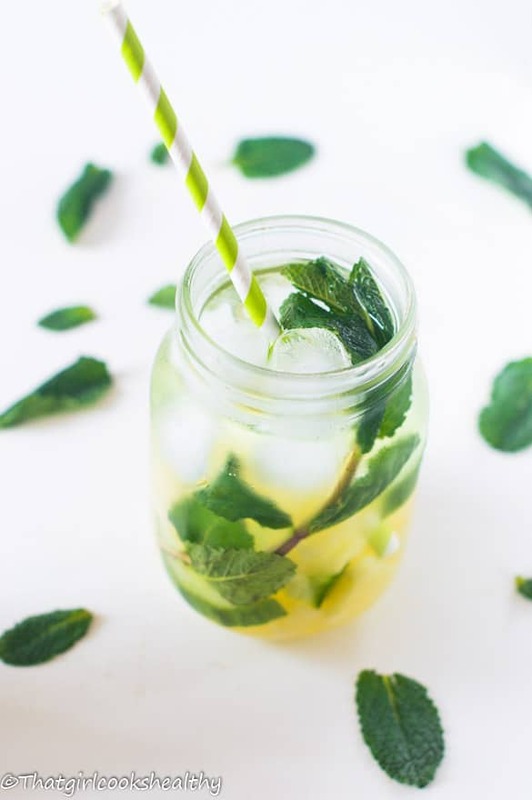 Add all of the ingredients to your glass or container of your choice and replenish with more water accordingly (fruit will steep and taste more concentrated overtime). This looks so bright and beautiful and refreshing! I just want a straw! And you are right, we absolutely all need to drink more water. I keep my water bottle with me throughout the day, but I still probably don’t get enough. I think adding some fun flavors like this would certainly encourage me to drink up! Thank you for commenting Kathryn. Yes I agree we all definitely need to drink more water with or without the fruit. I love this recipe. This is great for water drinkers, like myself, to add some flavor. I follow a gluten free diet also. I just discovered plantains, my new favorite thing, and recently posted plantain chips on my site. I must try your green plantain fries recipe soon! Glad it meets with your approval Christine. I love this idea so much! And how nice to take a few minute to prepare something delicious and so good for your body. It’s a true treat that you can feel good about!!! I aim to please, yes it’s so nourishing and incredibly healthy at the same time. This looks so refreshing and a great way to get ore water in my day. Thanks for sharing! I should do this especially come summer. In the Maine winters I do a winter version with spices. in a kettle I put fresh ginger, stick cinnamon, mint leaves (if I have some), whole cloves and allspice and keep it on the stove. As I take some out I replenish with more water as it too gets strong over time. Thanks for commenting David, your winter version sounds great. All those spices mentioned are generally warming so I can only imagine how it would taste. I’m definitely going to give it a try. 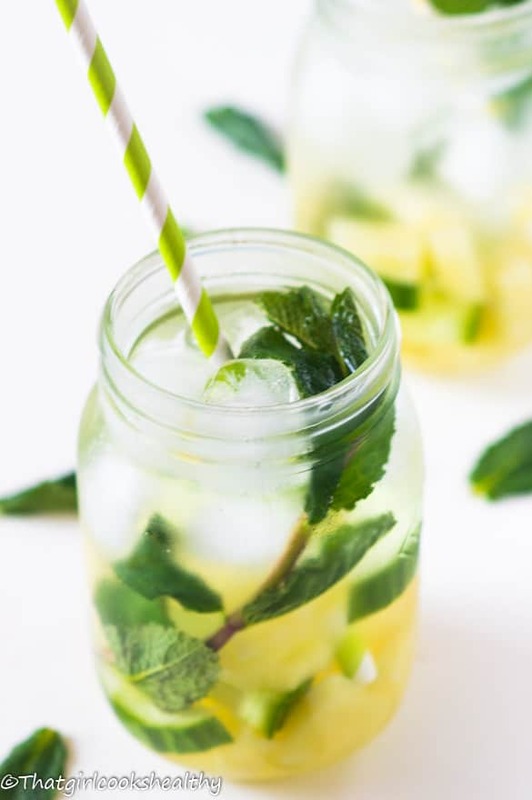 Judging by its appearance, this infused water is already thirst-quenching! Excited to make this as soon as a get home! I’m loving the eagerness to try this recipe. I promise you will LOVE IT. Remember the longer you leave the water to steep with the fruit, the more concentrated the flavour will become. 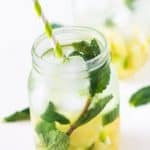 You did a fruit infused water recipe! Haha, looks lush – I still haven’t gotten fully into this yet but come summer time this will definitely be a go-to!